Central Hinds wicketkeeper-batsman Natalie Dodd claimed the top individual honours at the Central Districts Cricket awards on Friday 22nd March. Natalie Dodd added the Central Hinds Hallyburton Johnstone Shield Player of the Year (one-day cricket) and supreme Central Hinds Player of the Year trophies to the NZC Women’s Domestic Player of the Year award and the Ruth Martin Cup for women’s batting that she had collected the previous night at NZC’s national ANZ New Zealand Cricket Awards. In her first season representing Central, prolific Dodd produced one of her best ever seasons in the one-day arena with 652 runs from 11 innings at a stunning average of 108.66. In five of those matches, the opposition could not find a way to dismiss her as she raised her bat for two centuries and two half centuries. With a career best 142, Dodd partnered with captain Anlo van Deventer to set a new national record for women’s List A partnerships (any wicket) of 328, at Palmerston North’s Fitzherbert Park. Several major CDCA and NZ records were broken in the match and the dynamic duo would combine again in the Grand Final at New Plymouth’s Pukekura Park to lay a crucial foundation for the Hinds’ drought-breaking win. A standout white-ball season from winning Central Stags T20 captain Tom Bruce was likewise recognised at NZC’s ANZ New Zealand Cricket Awards where Bruce was named 2018/19 Burger King Super Smash Men’s Player of the Year. Bruce was also named joint winner of the Central Stags’ award for T20 Player of the Year, sharing the award with pace bowler Blair Tickner. 2018/19 also became the first summer that the Stags won both New Zealand’s first-class and T20 trophies in the same season, while the Central Hinds, under coach Jamie Watkins, won the Hallyburton Johnstone Shield Grand Final for the first time since 2009/10 after an outstanding one-day campaign across the season. 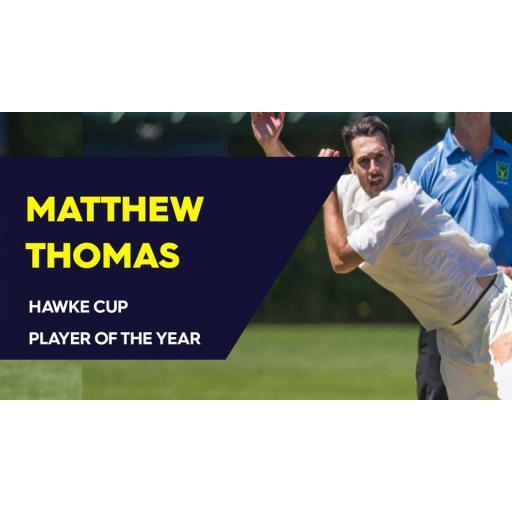 Taranaki Men's representative Mattie Thomas was also named Hawke Cup Player of the Year.